This computer has no keyboard or mouse, yet is not an ordinary touchscreen pc. 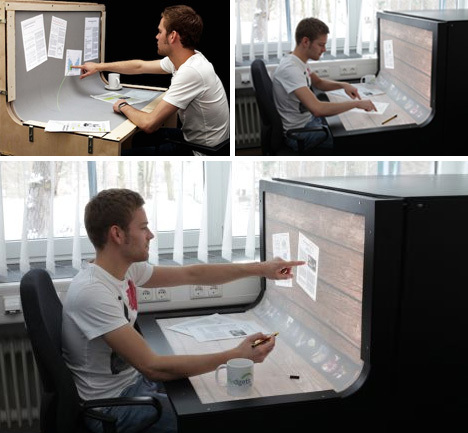 It uses a complete desk, and even bends up against the wall, turning the entire surface before you into a working area. You can drag items across the entire surface, from the wall down to the desk. This may not seem too impressive, but have a look at the video below. Now imagine combining this concept with for example Morphing screens, Tactus technology, or a 3D motion control interface.